The hurricane shifted a little southwest, aiming farther inland then previously predicted. It is expected that coastal areas receive 20 inches of rainfall, with some areas reaching 40 inches. 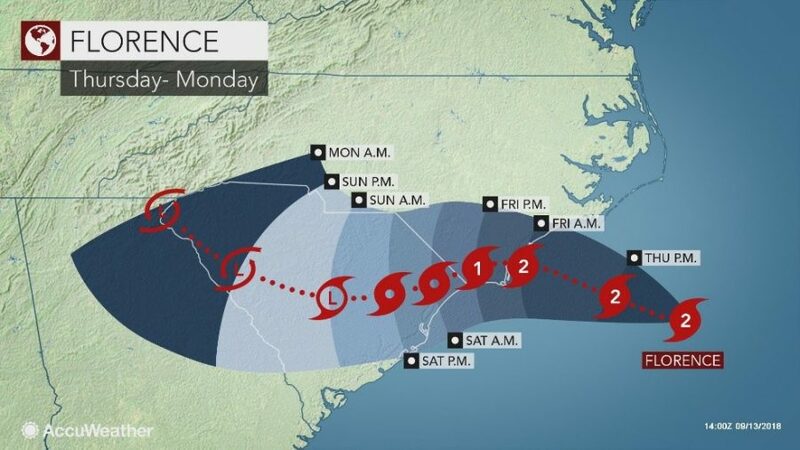 Duke Energy- the main electricity supplier of North and South Carolina- estimated that 3 million people will lose electricity during the duration of the storm. So far, 88,000 homes are without power, according to the North Carolina Emergency Management. Thankfully, the hurricane became a Category 2 with winds reaching 100 mph. However, even though the wind power decreased, Florence is still expected to dump 13 trillion gallons of rainwater. That’s enough to fill more than 15 million Olympic-size swimming pools! The highest waves could even reach 83 feet. The state of Georgia declared a state of emergency, joining Virginia, Maryland, North Carolina, and South Carolina. About 1 million people are under mandatory evacuation, with more than 6,700 people spending Wednesday night in 147 Red Cross shelters in Virginia and thee Carolinas. In addition, more than 1,300 flights from the US East Coast have been cancelled. There is no major effect of Florence on Florida at the moment, other than rougher seas and apparent elevation in sea level.